Rotation of data around an axis by an angle is carried out. One can select one of "x-axis", "y-axis" and "z-axis". The unit of angle you can enter in a text-box is degree. yoshinoGRAPH tries to plot data by assuming they are in Cartesian coordinate. Thus one needs to convert coordinate if data are in ploar coordinate (r, θ, φ), where r is distance of a data point from the origin (0, 0, 0); θ is the angle between the z-axis and the radius vector; φ is the angle between the x-axis and the projection of the radius vector onto the xy-plane, respectively. 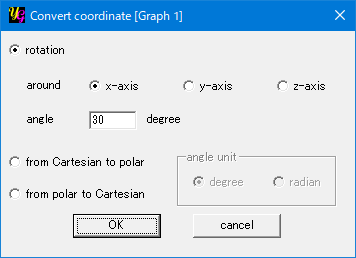 One can select "degree" or "radian" as the angle unit. This is the opposite operation to "from Cartesian to ploar"